Today’s software market is practically flooded by system information tools and while plenty of them are reliable, the way they offer insights about your computer’s various hardware parts, all of them deliver this information using similar methods. 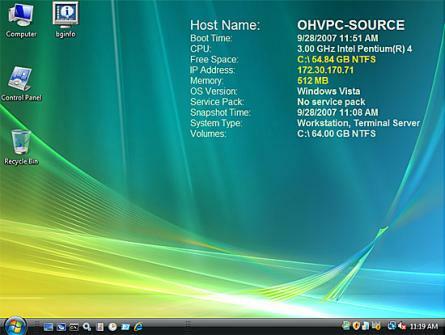 This typically is achieved by displaying the data directly in the interface, via system tray icons or by installing desktop widgets. BGInfo is an interesting system information program which was designed to offer all the details regarding your computer by applying it on your desktop wallpaper. The tool will scan your machine and shows the information by using your wallpaper to apply text on it and generate a new one. The application displays a comprehensive amount of system related data like IP address, MAC address, boot time, CPU, DNS server, default gateway, system type, OS version, volumes and so on. Nevertheless, you can customize which types of data you want BGInfo to display as well as where should they be placed on the desktop wallpaper. Furthermore, the friendly UI lets you quickly set up alignment, fonts, size and colors. The program also lets you limit lines to a custom value and supports multiple monitors.